Posed near Auburn pilot Rich Aldrich’s 1940 Stearman Kadet, Dylan Jones, ‘Shelby Condon, Catherine Fagen and Malcolm George model colorful SkyBelts that are gaining popularity with both teens and pilots. SkyBelts, colorful “belts” of webbing held together with standard airplane seatbelt buckles, may be the latest “really cool” fashion statement for young teens in America, but they’re also becoming surprisingly popular with pilots and aviation enthusiasts. Featured in publications including J-14, a junior teen magazine, and Alaska Airlines’ in-flight magazine gift-guide, SkyBelts also received national attention on April 2 when the belts were among the gift items in the Nickelodeon cable channel’s Kids Choice Awards program, a Ben Stiller-hosted show with celebrity entertainment guests. SkyBelts are also being marketed in Seattle’s Museum of Flight, and soon they’ll be showing up in gift stores at airports in Seattle, Los Angeles, San Francisco and Atlanta. Internet orders have landed on their website from England, France and Finland, and the belts are showing up at trade shows and air shows. In early July, SkyBelts will be on display at the annual Northwest EAA Fly-In in Arlington, Wash., which attracts up to 50,000 pilots, warbird aviators and flying enthusiasts. The aviation-themed product entered the marketplace only a year ago, after former United Airlines flight attendant Jennifer Longley and her husband, Matt, tried to find a marketable item for Internet sales. Matt fashioned a belt from an old Cessna seat belt, which attracted rave reviews when Catherine, the couple’s 15-year-old daughter, wore it to school. The family’s marketing ideas began soaring; a year later, sales are climbing, thanks to a multi-faceted publicity and marketing campaign the fledgling entrepreneurs created one venture at a time. Now in full production in the family’s converted barn on rural property in Enumclaw, Wash., southeast of Seattle, SkyBelts come with authentic aircraft seat-belt buckles and interchangeable webbed belts in neon pink, red, green, raspberry, black, white, purple, yellow, blue and a variety of other colors. To personalize the belts, the family has designed a couple dozen metal SkyClips that hook on the belt for decoration, and hold the flopping tail of the adjustable webbed belt. One clip, featuring art-deco styled “flying wings” insignia, also includes a single-letter initial for each buyer. Others feature messages such as “Love is in the air,” or colorful “state” images to show places the wearer has visited across America. More SkyClip designs are being added to the company’s website each month. 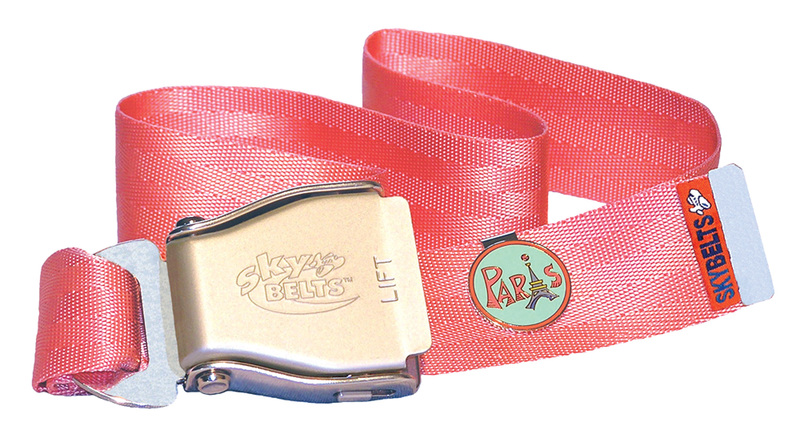 A percentage of the sales of SkyBelts and SkyClips goes to the family’s favorite charity, Miracle Flights for Kids, a nonprofit organization that provides free flights for children who need medical treatment. Jennifer said the family is as amazed at the success of the belts as anyone. Her aviation background, as a flight attendant whose father and brother are both pilots, and her East Coast work as an interior designer helped inspire the SkyBelts concept and the design of the SkyClips accessories that can be added to the belts. Matt, owner of Creative White Space, a website design business, helped launch their marketing program. Catherine quickly became the fashion advisor. The couple’s 8-year-old twins, Johnny and William, are involved, too. A close family friend, Tina Mason, helps as office manager. As part of their promotional program, Catherine gathered three of her friends for a photo session. They modeled the Skybelts and Skyclips in front of a restored Stearman owned by Richard Aldrich of Auburn, Wash.
Today, the family’s barn includes boxes of airplane seatbelt buckles and 5,000-yard rolls of belt webbing, in preparation to fill the growing number of orders coming in as word spreads of their new products, which seem be finding new markets each day. Ironically, the family’s SkyBelts may be hitting the market just in time to help out the world’s airlines, too. Now, Skybelts offers kids a new, legal source for getting their seatbelts for what could become a global wave of new “aviation fashion” for the teen market. But it looks like pilots, flying enthusiasts and air travelers will be in line, too. SkyBelts is a new entrepreneurial venture in Enumclaw, Wash., launched by Jennifer and Matt Longley (at right) and their daughter, Catherine Fagen. At left is office manager and friend Tina Mason with the SkyBelts display. “The sky’s the limit,” said Jennifer, who’s gotten used to pouring coffee and heading to their office in the barn each day to make belts, ship orders and see what happens next. Most of the SkyBelts are priced at $32.95, which includes a free SkyClip. Other belts can be ordered for $10.95 each, so wearers can easily change colors. A variety of metal SkyClips are available for $4.95 to $6.95. For more information, visit [http://www.skybelts.com] or call 866-SKYBELT.